​You can turn up "I want to break free" as loud as you like, hoovering is still a pain in the backside AND it eats up hours of your precious time. But now, thanks to a marvel of eccentric Japanese engineering, you can put your feet up and let the Mocoro Robot Cleaning Ball do all the work. It's a fluffy robotic duster with a mind of its own; roaming freely around your home picking up dust and filth, changing direction whenever it hits an obstacle so it doesn't get stuck in tight corners or insist on trying to go upstairs. Just sit back and let it do it's thing – it's got so much personality you'll expect it to hop up on your lap and start purring. To stop this playful ball from wasting battery there's an internal timer that pauses it after 15 minutes until disturbed again (a very gentle kick will do). 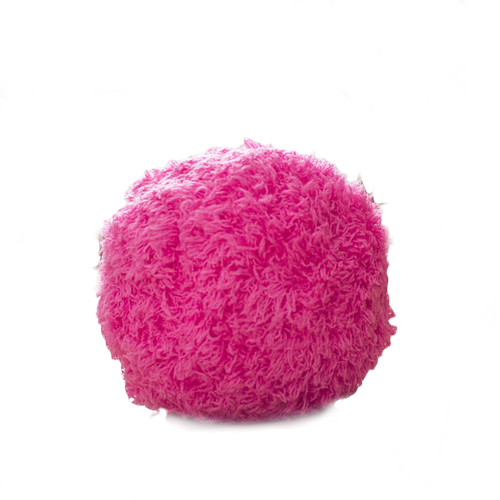 The pink microfibre coat can be brushed clean and is easily removed to be hand or machine washed. Did we also mention that it's the greatest cat toy ever made? Now you can come home to sparkly clean floors AND exhausted pets.